I love my cat! Originally he had been selected for other family members, but he decided that I belonged to him. We got Renaldo from a local adoption agency. He is a white and orange domestic short hair. His favorite activity is bugging me. I put makeup on, he is in the way. I go to the restroom, he paws at the door. At least he has stopped climbing up my back to get attention. At the point that I am writing this, he is setting on the computer desk, guarding the mouse, I think. This is Milo. 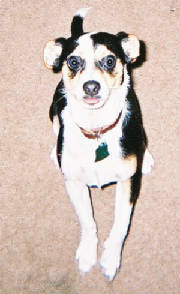 We rescued him from the pound in August of 2003 and is mostly rat terrier. He is lovable and a general nuisance. He hogs the bed, occasionally gets in the trash, and barks at the leaves falling from the trees. If I leave for five minutes, when I get back, he acts like he thought I had abandoned him. He worries with you, comforts you when you are sick, and then chews something up.